We had an extra day at Trinity, not leaving till today. Two reasons really. Brother Andy and family came over to visit last evening, and it was a lot easier for him to find us if we stayed put. And I was still feeling the effects of my exertions on Sunday. Up at 5 am, after losing an hour as the clocks went forward, on the road by 6 am, and running a half marathon in Liverpool at 09:30. The run went well, better than I expected actually. Cool and dry with no wind, it was a good day for a run, and the Liverpool course is enjoyable. Not my best time, but comfortable. Enough left for a sprint over the last 200 yards, anyway. Out of 6,500 starters I came in 2260th, 123rd in the 50+ age category. For the first time in 20 years Liverpool is hosting a marathon in October. Part of the route will follow Sunday’s course. I’ve always said I’d like to do a marathon before I hang up my running shoes, and having failed to get into the London, maybe this could be the one. Not this year though, I’m committed to the Great North Run again in September and I don’t think I’d manage both. 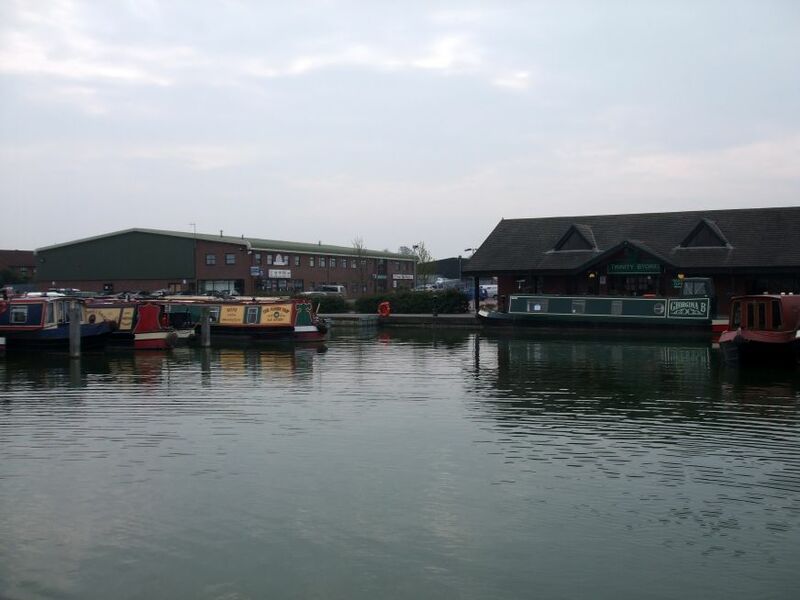 We made full use of the marina facilities, getting the bedding washed and leaving this morning with tanks filled or emptied as appropriate. Off at around 11:00, we only made a short trip. We always enjoy a stay here. 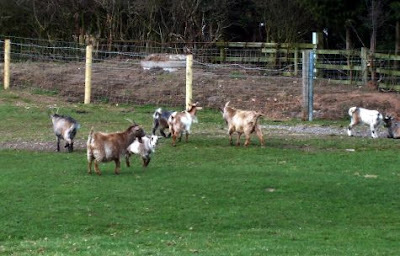 The staff are pleasant and helpful, there's a big field for the dogs to run in, and you're not that far from the town. Couldn't do too long though. On the edge of Hinckley we passed the Triumph factory, the last remaining example of a fine motorcycle production heritage. 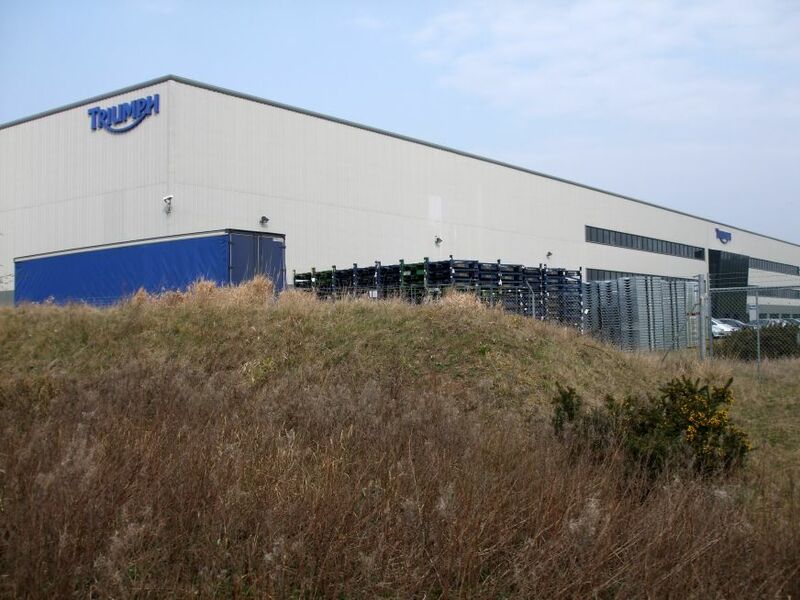 There’s a potted history of the company here, and the official website is here. We pottered on slowly (you can’t go fast on the Ashby, it’s too shallow), enjoying the Leicestershire countryside in the occasional sunny spells. 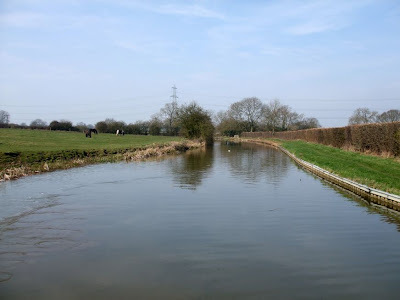 Typical Ashby Canal scenery near Bridge 20. 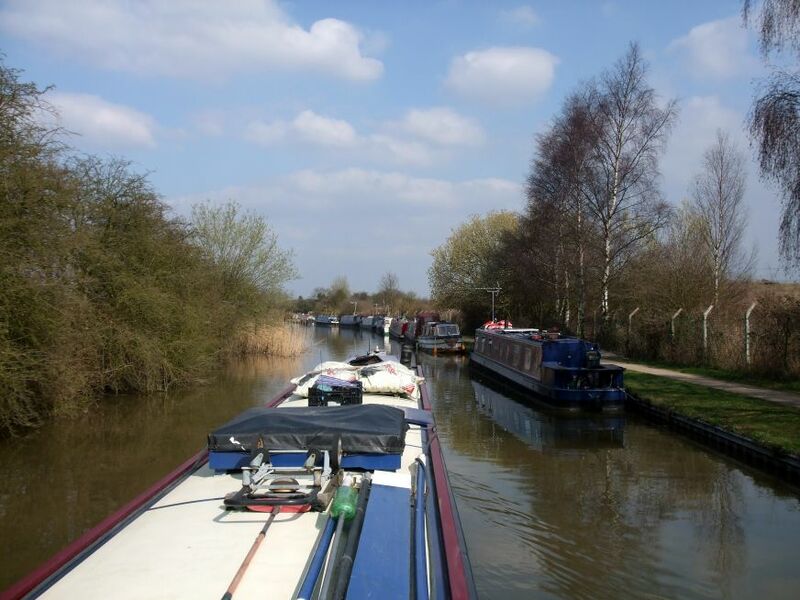 We moored after only 2 miles, near Basin Bridge. We’re going to have a very gentle trip up to the terminus and back. Since we were here last there’s been a short length restored at the end, above Snarestone, part of a project to reconnect this section to the bit up at Moira. 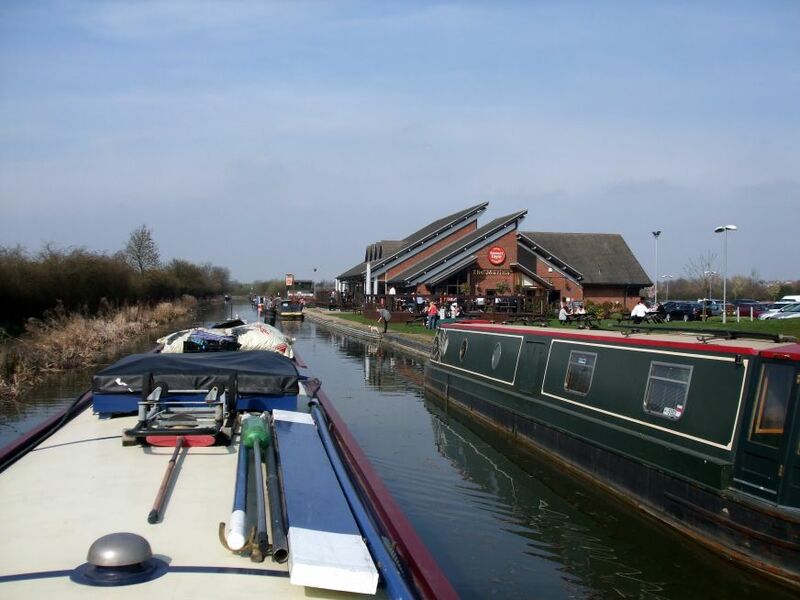 The wonderful weather is still with us, I wonder how long it’ll last? 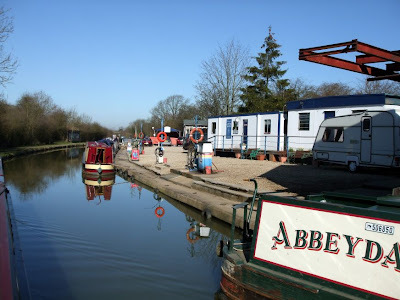 I got a few bits and pieces done yesterday, the main one being a good clean through the boat, mats and rugs vacced, the floors washed and the last set of curtains laundered. Then it was Dog Grooming Part II (Part I was Wednesday). A thorough going over takes some time, as Meg doesn’t like her hair pulled, and loses patience easily! A couple of hours gentle teasing and she’s 99% tangle free. Now all she needs is a shower. That’s even MORE fun! We had a lovely sunset last evening, the best for a few days. This morning Meg and I had a walk around Burton Hastings. 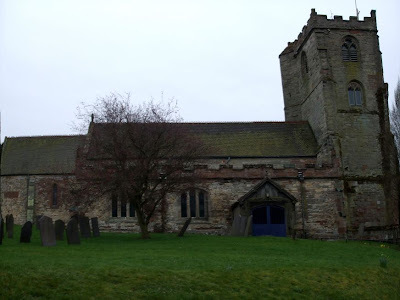 A small farming community, like many in the area, it has a fine 14th C church. 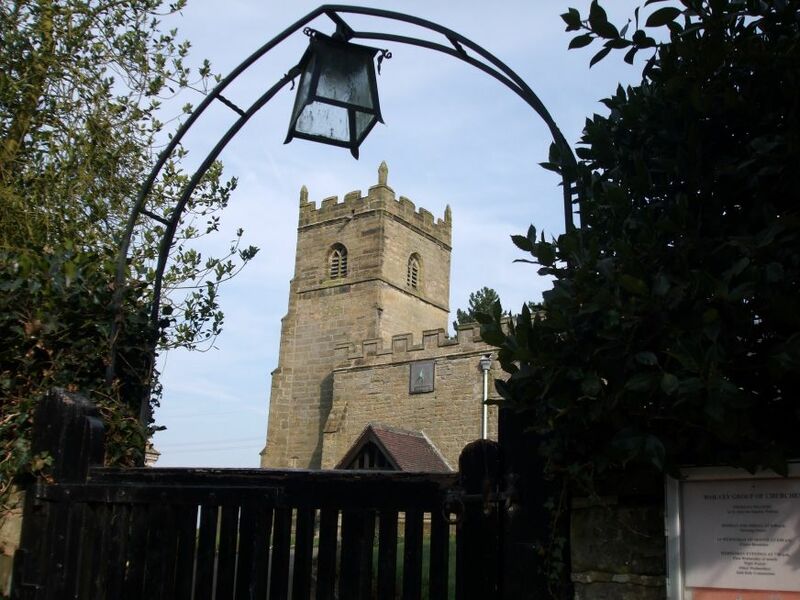 St. Botolph was a 7th Century monk, Saxon by birth and sent to the continent with his brother for their education. The family must have been fairly well off, although Botolph’s story is hazy. It is believed that the town of Boston in Lincolnshire was named for him, after he built (had built) a monastery there, although there are also indications that the building was at Iken in Suffolk, a lot further south. 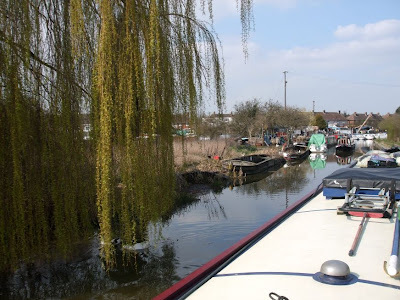 We got away at around 11:30, leaving our quiet mooring at “Hospital Corner”. The Ashby isn’t known for it’s dry towpaths, but this stretch has a good, clean, grassy bankside. 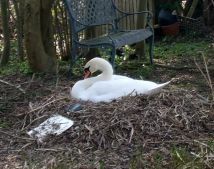 There’s a pair of swans setting up home just around the corner. Dad was patrolling while Mum had a nap…. They’re on the offside, so shouldn’t be disturbed, although they are among some moored boats. Just about where they’re nesting we passed from Warwickshire to Leicestershire, but the rolling countryside is still just as peaceful. We topped up the water tank near Bridge 15 where the Roman Watling Street still carries traffic after 2000 years, then cruised slowly into Hinckley. The road is still there, but the traffic is a tad faster…. This arm used to run to a large warehouse and wharf managers house. The building is still there on the Coventry Road but the arm doesn’t reach it anymore. Shortly after we arrived at Trinity Marina, with the busy Brewer’s Fare restaurant alongside the canal. We moored up on our allocated berth, plugged in and set up the TV. Then I went off for a car from Enterprise, ready for the weekend. That’s it, the long trousers have gone into storage, and the shorts are out! With temperatures in the high 20s the last couple of days, it’s time to top the tan up. We didn’t move yesterday, catching up with a bit of work, but a lot of other boaters did. 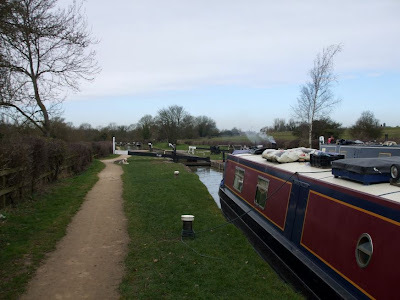 The 7 day moorings where we’d stopped filled up on Monday evening, then nearly emptied yesterday morning, before filling up again later. We joined the throng today, but later in the morning when the rush had subsided. There’s quite a community of live-aboards now, just up from the junction. About a mile from the junction there’s another disused arm, this leading to the now demolished Newdigate Colliery. 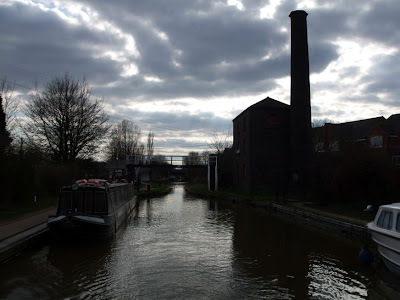 This area was peppered with collieries, making the Coventry and Oxford Canals busy routes, shifting boatloads of coal to demanding industry. The mines are now all closed, the structures dismantled and the shafts capped. The spoil heaps have mostly been landscaped, and are being recolonised by nature. 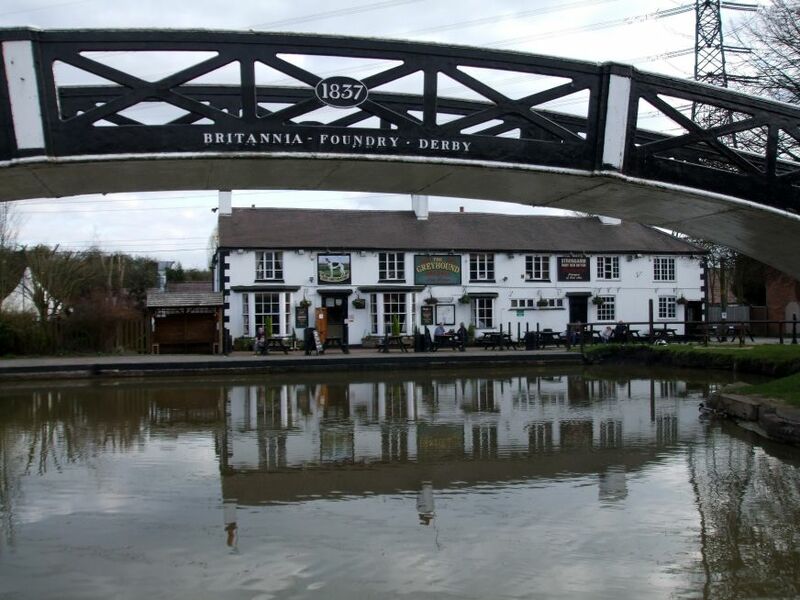 At Bridge 14 stands the Navigation Inn, but you’ll not get a pint here at the moment. Navigation Inn, closed for business. Charity Dock is always worth a look, to see what’s changed since we last came this way. 2½ miles after setting off we approached Marston Junction, and the Ashby Canal. 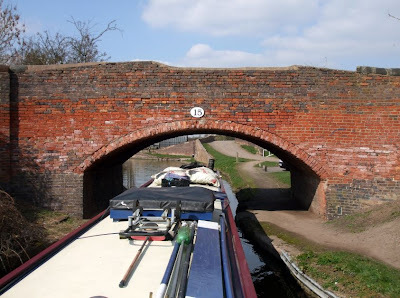 Round the blind turn under Bridge 15, Marston Junction visible through the arch. Oddly enough, the junction bridge carrying the Coventry Canal towpath isn’t Bridge 1. That distinction goes to Orton’s Bridge, a couple of hundred yards on. The Ashby heads east-ish, away from the built up areas of Bedworth and Nuneaton, into rolling farmland. 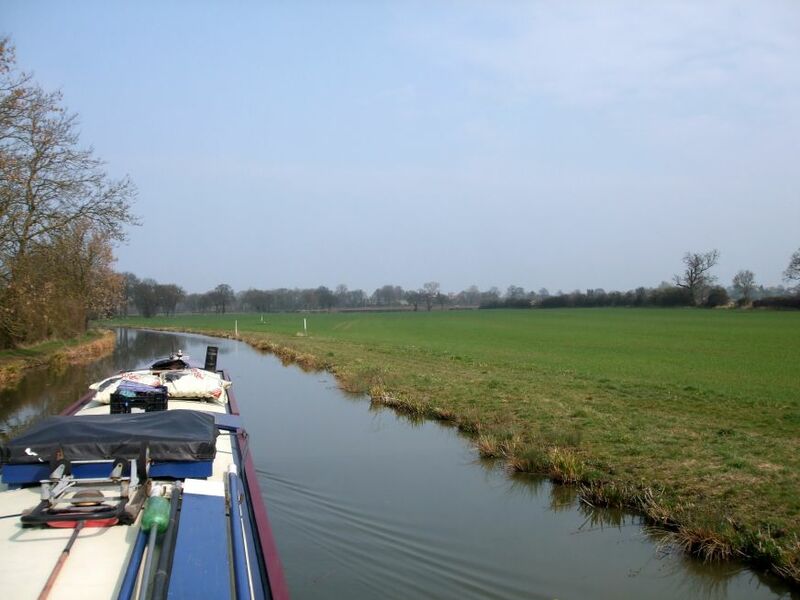 We pulled over on a spot we’ve used before, near Burton Hastings. 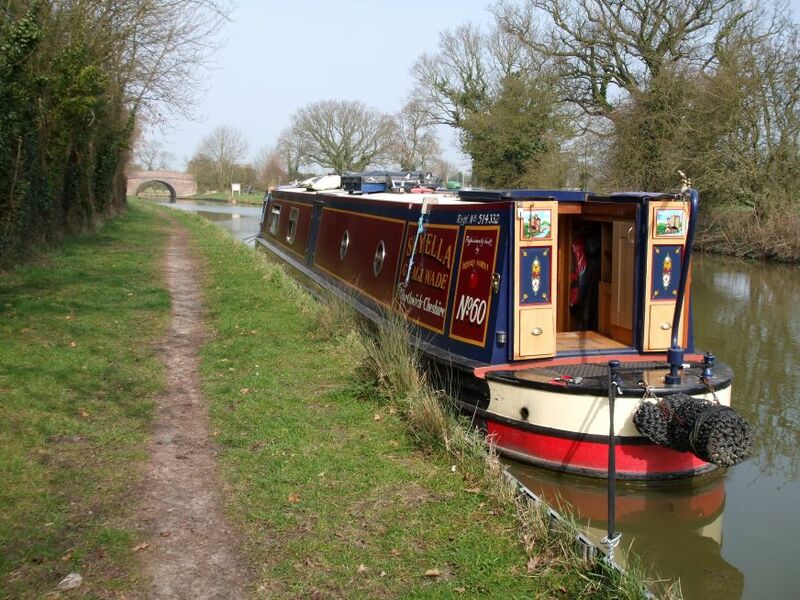 We’ll stay here tomorrow, then Friday we’re heading into Hinckley to Trinity Marina and a weekend berth. On Sunday I’ve got my first event of 2011, a half-marathon in Liverpool. Looking forward to it…. I think. Another fine sunny day today. 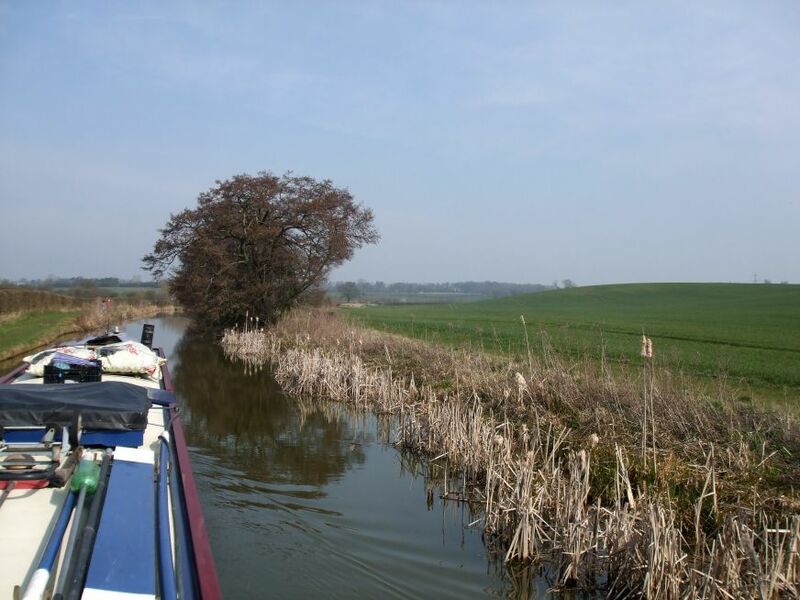 After yesterday’s maintenance related exertions it was good to be cruising again, relaxing on the tiller. Just around the corner is Rose Narrowboats at Stretton Stop. It was here that we got a serious electrical fault sorted out, way back in 2006. I’ve yet to hear a bad word said about them, everyone we’ve met who’ve used them has had nothing but praise for their work. Their hire fleet looks good, too. 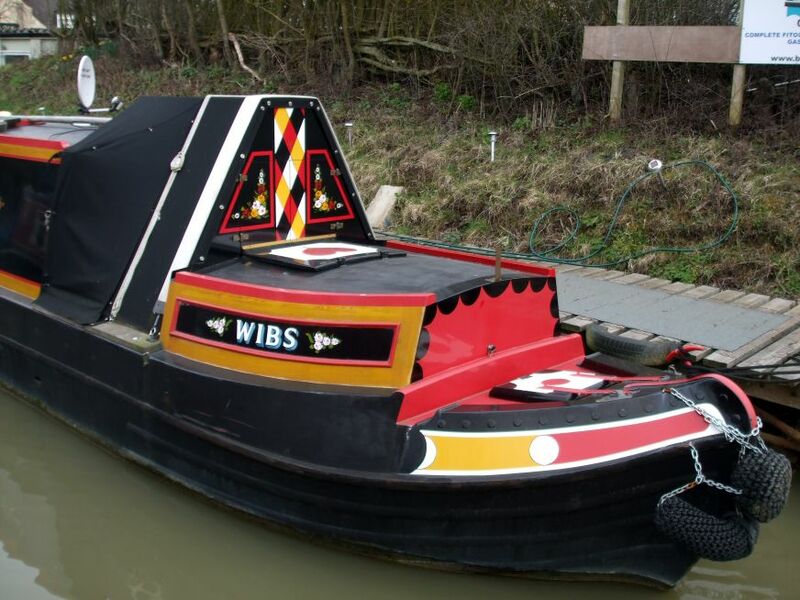 Some of the boats may be getting on a bit, but they’re all freshly painted and tidy. There is a long line of permanent moorings on the offside near Grimes Bridge, and here we came across Iain and Alison on NB Gosty Hill, delivering coal. 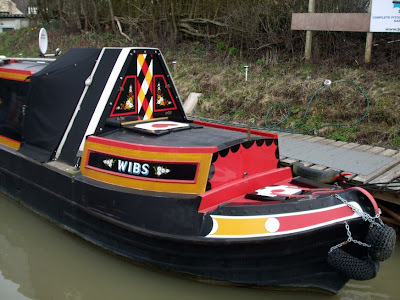 Heavily loaded, she looks just like a working boat should, with the water level with the top guard. We exchanged pleasantries as we drifted slowly past, then pushed on towards Ansty. The cracks are starting to show in the maintenance programme at Hollyhill Bridge. 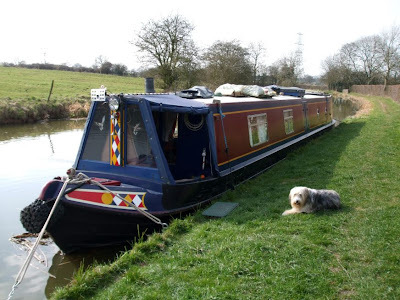 We hadn’t intended to stop at Ansty, but Meg was getting a bit fidgety, trotting around with her back legs crossed, so we pulled onto the water point to fill the tank and empty the dog. A job less for when we arrived at Hawkesbury. A change from lambs - goats. 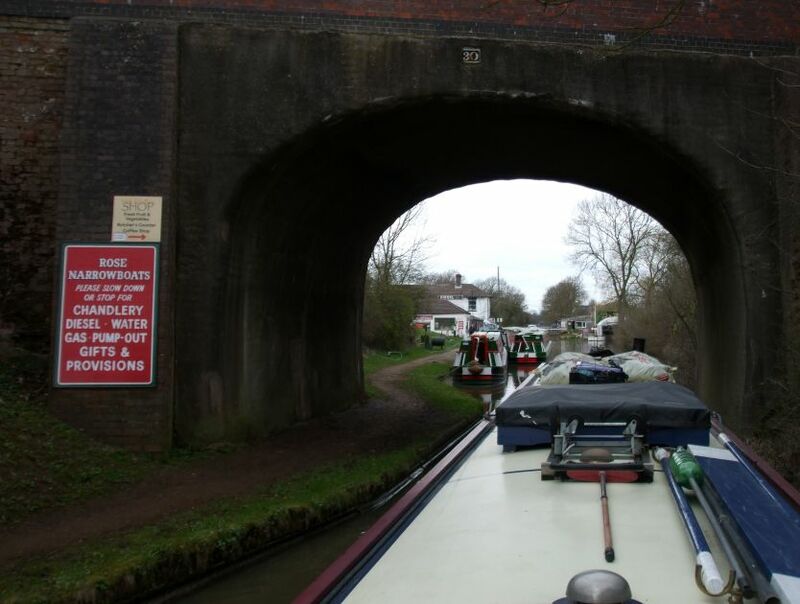 Leaving the village the canal heads towards the M6, running parallel for about a mile. 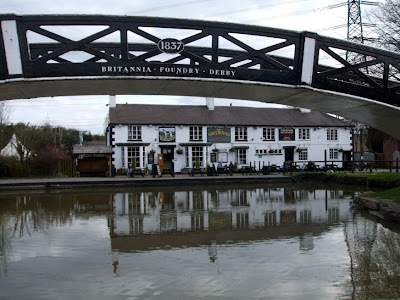 The Wyken Colliery Arm goes off under a towpath bridge. This is a new arm, the original was buried when the motorway was built. 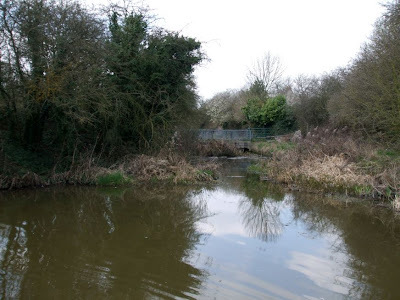 Of course, the colliery itself is now no more, the arm is occupied by the Coventry Cruising Club, and the mine site is a nature reserve. Another mile and the shallow stop lock at Hawkesbury Junction comes into sight. 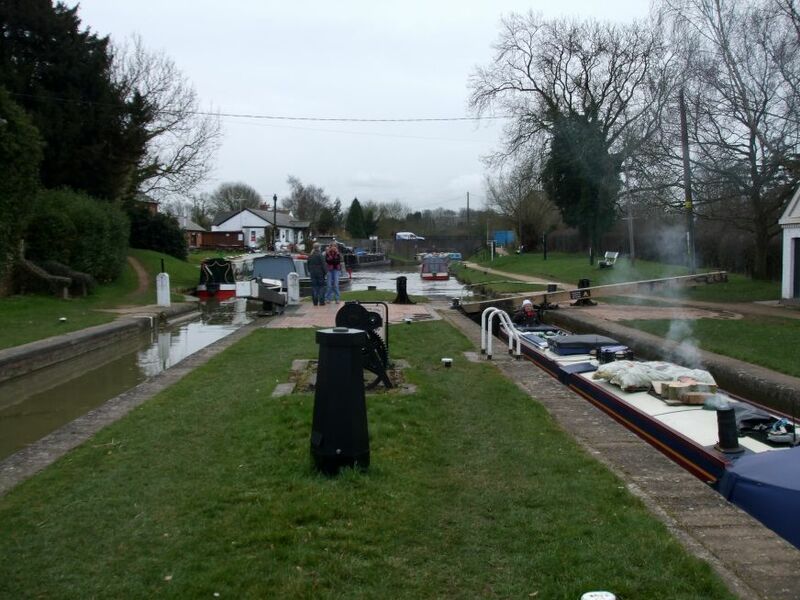 The junction is also known as Sutton Stop, named for a well-respected family of lock-keepers who looked after it. 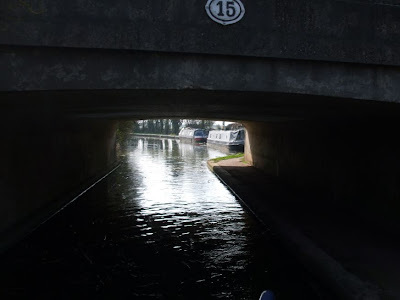 After the lock we negotiated the 180° turn onto the Coventry Canal, then reversed back onto the wharf to empty the loo and the get rid of the rubbish. Heading away across the junction we had a good view of the Greyhound Inn through the arch of the bridge across the end of the Oxford. Then we idled through the narrows alongside the old engine house before tying up a little further on. This is a listed building, and once housed a steam pump engine to supply the canal with water from a deep well. I took Meg for a walk before tea and had just got back when a couple walked past. I said hi, and noticed a lead in the woman’s hand so automatically looked for the dog. No canine in sight, but there was a deal of splashing going on behind Seyella. 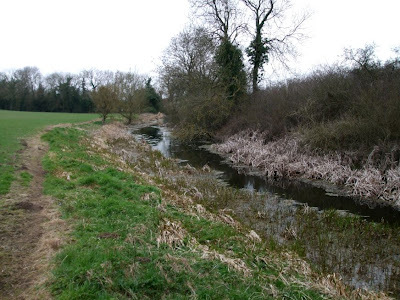 I shouted to the couple, then ran back and hauled a bedraggled Yorkshire Terrier out of the cut. She was OK, but wouldn’t have lasted more than a couple of minutes in the cold water. I shudder to think what would have happened if I hadn’t seen her. There was no chance of her getting out onto the bank herself. Both sides have piled edges. Towelled off, she seemed none the worse for her adventure. 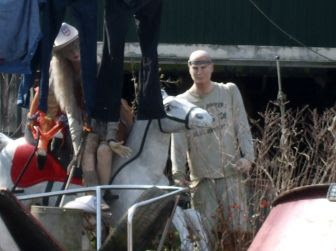 I hope the owners keep a closer eye on her in future…. 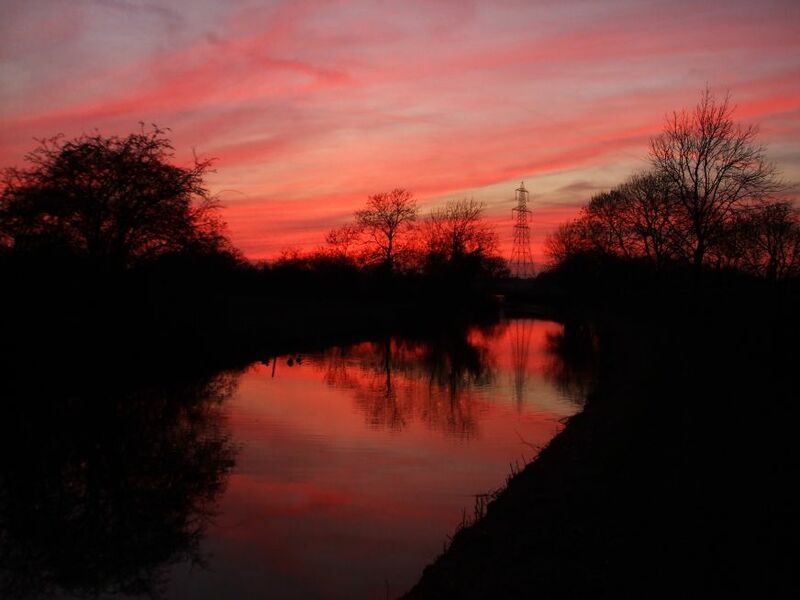 Did anyone notice that it was the Spring Equinox yesterday? Almost equal daylight and nightime lengths. Certainly looking forward now! Clocks go forward next weekend, too. We left fairly early yesterday, grocery shopping to do in Rugby. And the stub of a short arm leading towards Clifton Mill. We moored for an hour near to Bridge 58 so I could make a visit to the handy Tesco, then crossed over the River Avon on an aqueduct before heading out to Newbold on Avon. Looking down on the Avon. Yes, it’s the same one that goes through Warwick, Stratford and Tewkesbury but little more than a stream here. 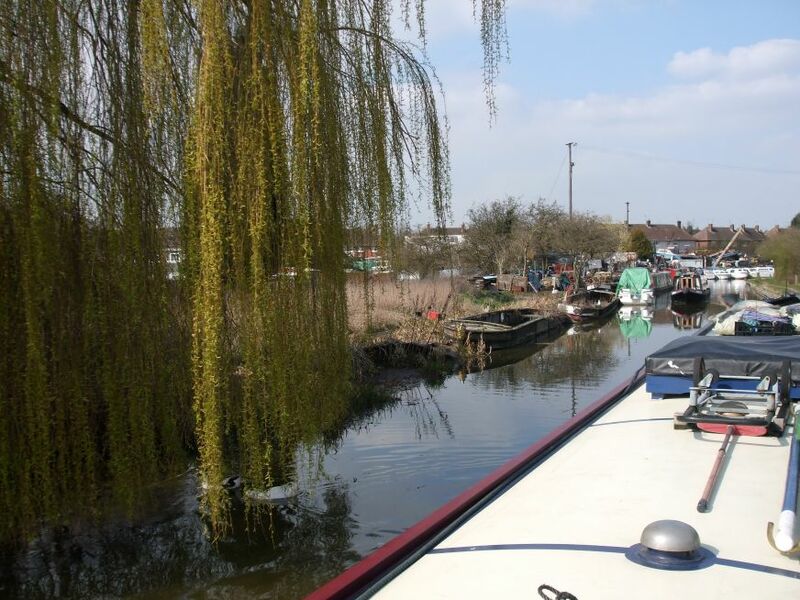 The Rugby Town Arm branches off to the left, Willow Wren have a hire base down there. 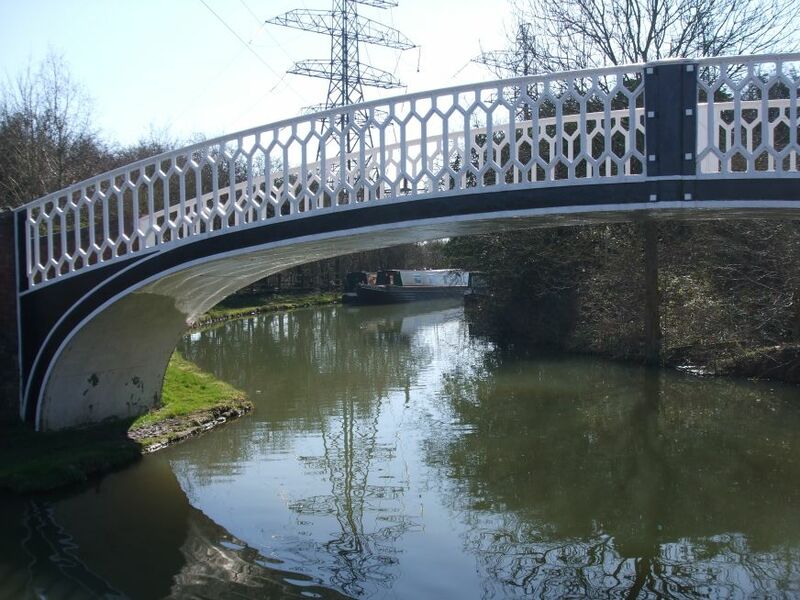 These elegant arched cast iron bridges are very much a feature of this canal. 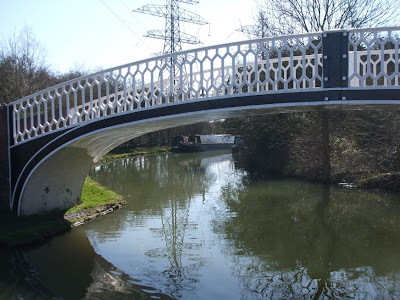 When the navigation was improved in the 19th C, isolated loops on the towpath side are crossed by these. 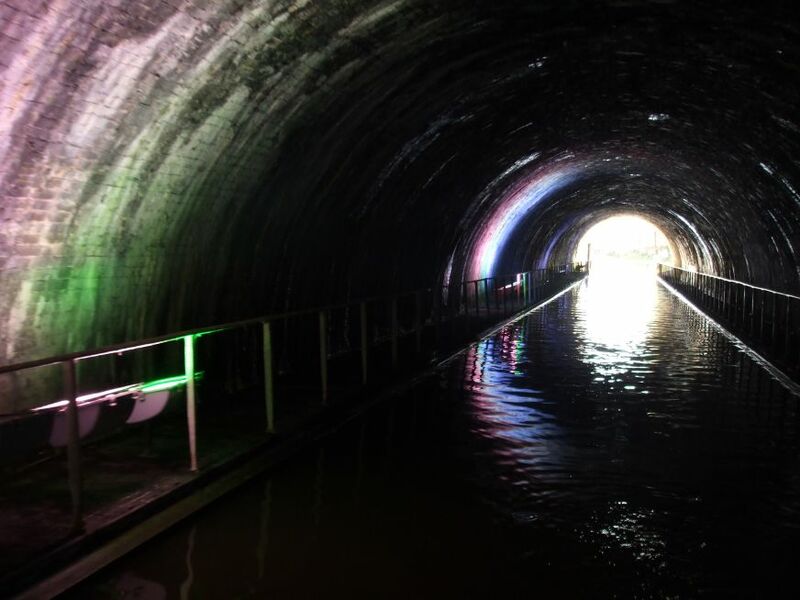 There’s a short 250 yard tunnel at Newbold, unique in that it’s illuminated with coloured lights. 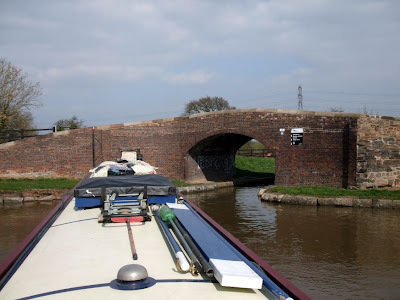 At Falls Bridge, just a few hundred yards from the tunnel, there’s an example of one of those loop spanning towpath bridges I mentioned. 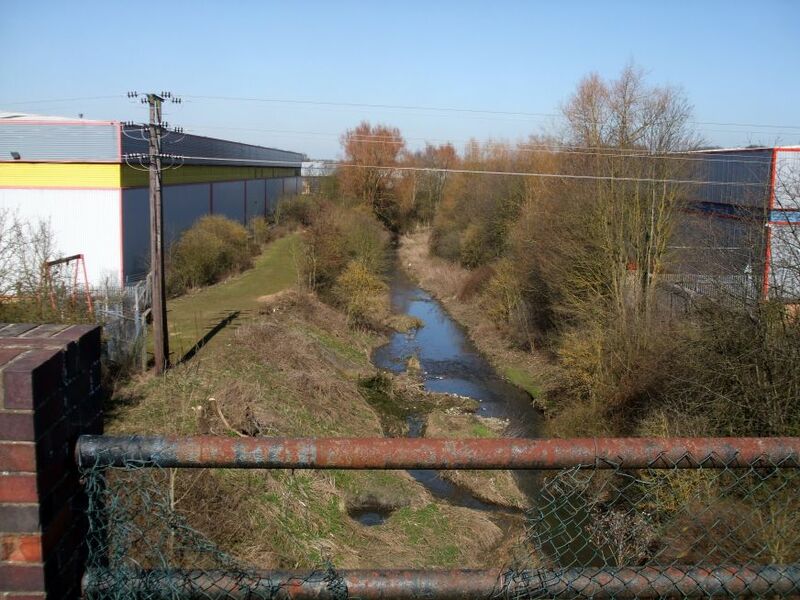 Bridges 47 and 46 would have been on the bypassed loop. 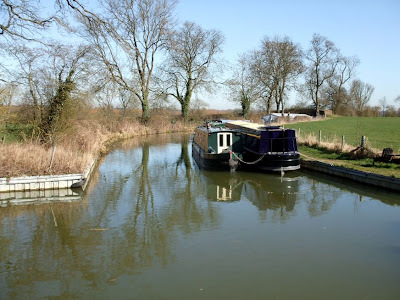 We pushed on another 2 or 3 miles, through All Oaks Wood, with buds appearing on the trees and the birds singing for company, and moored soon after. 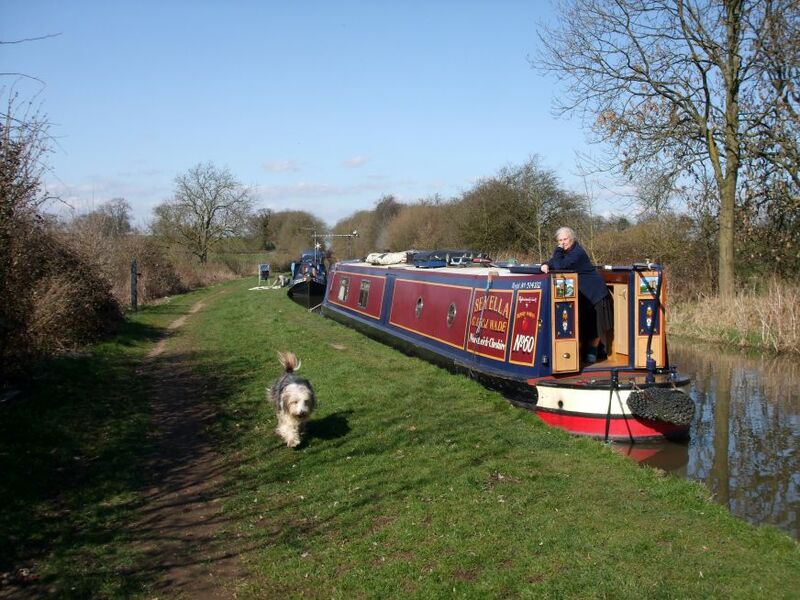 Moored on the wide, dry towpath just beyond the wood. As you can see from the photos it’s been a beautiful sunny day, but still cool out of the sun. 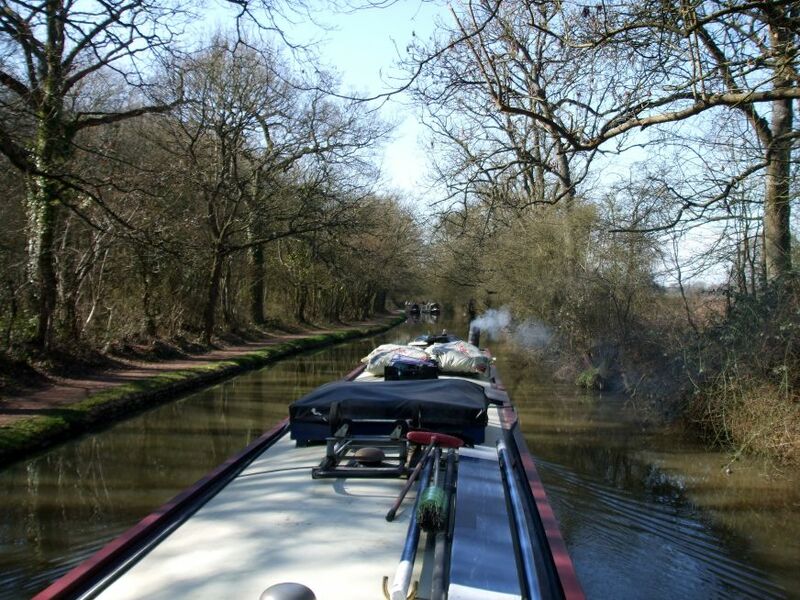 Carol says that boats are like freckles; the sun brings them out. It was certainly true today. Today I got stuck into finishing off the ceiling painting. 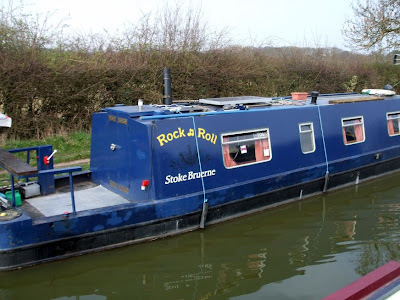 It’s all done now, from the bedroom at the stern to the saloon at the fore end. I’ll just have to re-assemble the wood trims tomorrow, but that won’t take long. I’ve also got the left side and roof of the boat washed off, and the last of the wood chopped. Windows cleaned and curtains washed completes the day’s task. 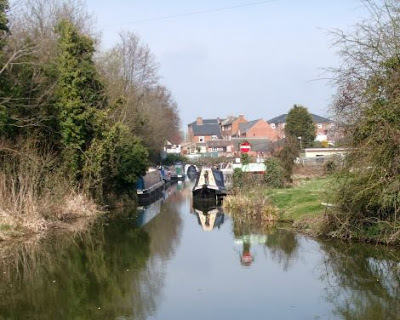 But before all this Meg and I took a walk up the canal, along an old loop to Brinklow, and back through the village. 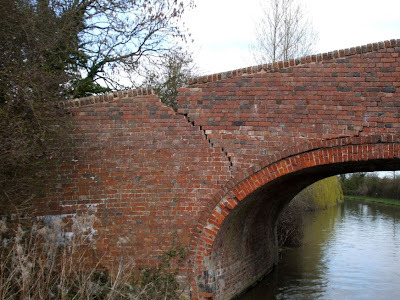 Part of the old loop near Brinklow. It shows how effective construction using clay puddle can be. After getting on for 200 years of disuse it’s still holding water. 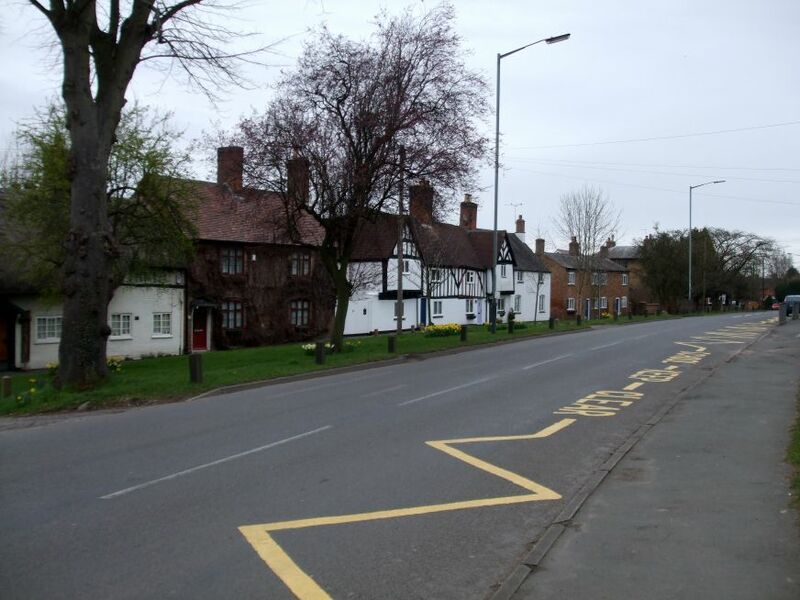 Brinklow is a pleasant village, with a wide main street running past old cottages and an impressive church. The 13thC St. John the Baptist Church, Brinklow. 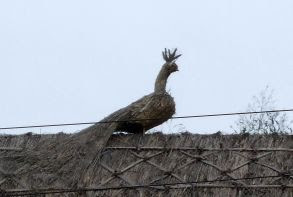 Peacock sculpture in straw on the thatched ridge on another cottage. 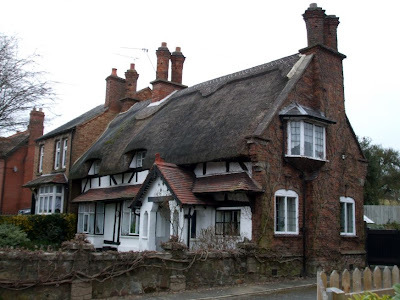 The village was an important market town in the Middle Ages, probably due to it’s position on the Roman Fosse Way. Today started out a bit grey, and the forecast was for a drop of rain but it hasn’t materialised. In fact it’s been T shirt weather outside. Isn’t it a shame that, despite people’s best efforts to keep things tidy, some cretin will spoil it. 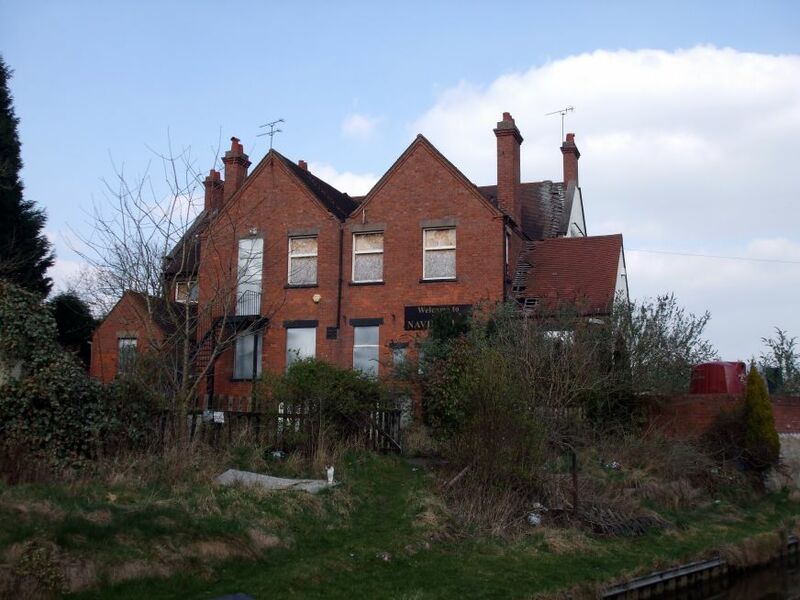 I often see rubbish fly tipped on country lanes, building debris and 3 piece suites seem to be favourite. 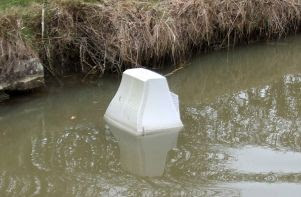 But this morning I was dismayed to count 4 TVs and computer monitors in the canal around Barby Wood Bridge. Someone must have had a clear out. 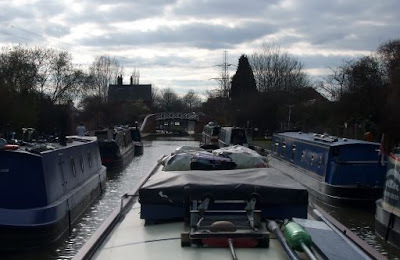 We got away around 10:30, in a grey and dull morning. There had already been several boats passed, in both directions. 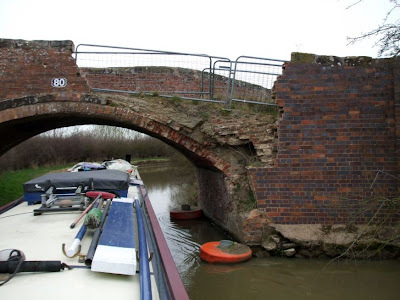 Bridge 80 doesn’t get better with age, it’s been like this for a year or two now. It took us about 80 minutes to get to Hillmorton Locks, the first narrow locks we’ve encountered since Lapworth. 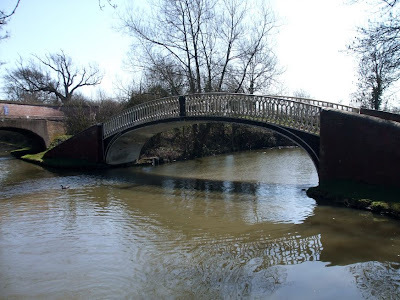 This flight of three was duplicated in the 1820’s to improve traffic flows, part of the improvements to the North Oxford which resulted in lopping 14 miles off the distance between Hawkesbury and Braunston Junctions. The locks are numbered from the bottom, 2 and 3, 4 and 5, and 6 and 7. 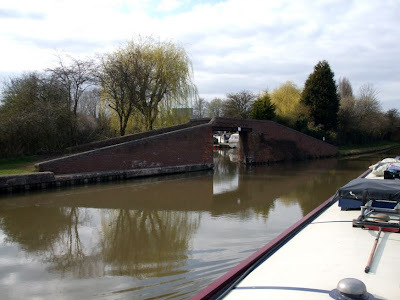 Lock 1 is the shallow stop lock at Hawkesbury Junction, 15 miles away. 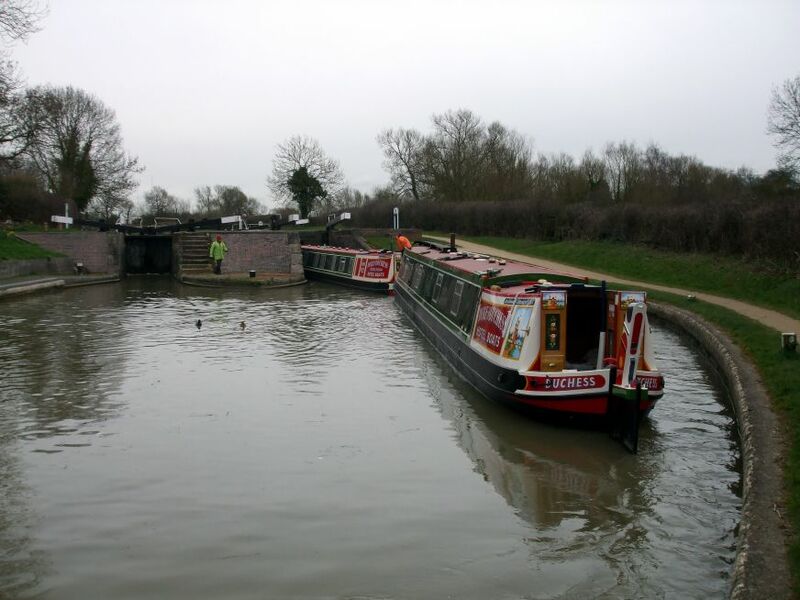 We passed the freshly repainted hotel boats Duke and Duchess at the middle lock. 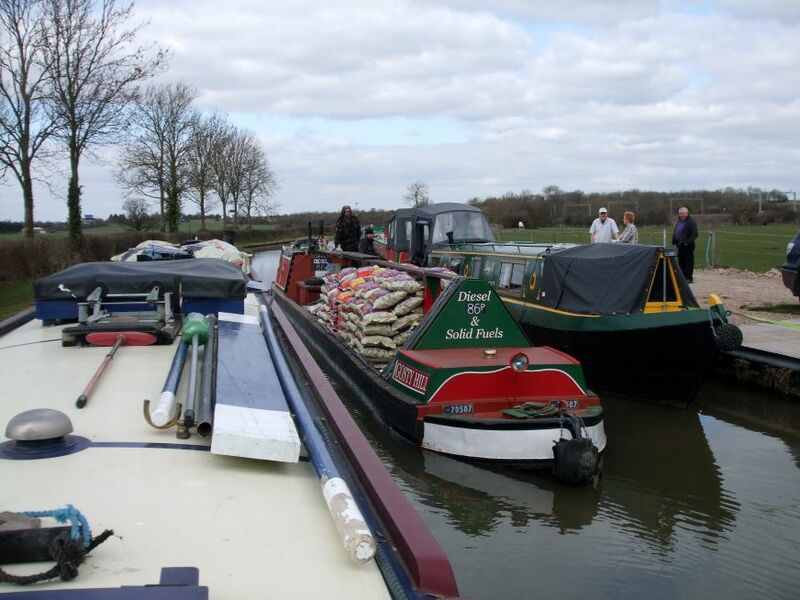 They were on the way for some engine work before the season kicks off. 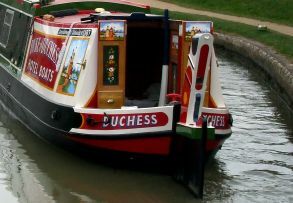 Hotel Boats Duke and Duchess. She’s got a beautiful bum….. Dropping down Hillmorton Bottom Lock. We pulled over just about a mile further on, near Clifton. I had a job to do on the engine. An exhaust bracket had come adrift, so I replaced it with a new one, hanging from the weed hatch coaming. The afternoon actually turned out very nicely, sunny and quite warm. Tomorrow is forecast to be good, too.